Our bedroom window has a view of Mont Ventoux in the distance so we capture this with a photo before going down for breakfast in the garden. The run out of town is not too bad and we are soon in dramatic, typically rocky, hilly and scrubby Provencal scenery interspersed with big hills and cliffs. Should be a quite challenging day of cycling. We are skirting the northern side of Mont Ventoux, although further away than the valley immediately flanking its northern slopes that we used once to return from a tour of Provence to catch the Bike Bus at Orange. We stop in Mollans sur Ouvèze to buy food. The river bridge and tower at its end are quite picturesque, so we pause on the bridge for a photo. From here we continue to Buis les Baronnies, which is bustling and is obviously a tourist stop because there is a large car and coach park. We try the OdT for information about the next few days weather forecast for Mont Ventoux, but they do not have any such information and our assistant makes no offer to use the computer sitting in front of her. In fact, despite how close we are to the mountain, there is scant information of any sort about this legendary “Giant of Provence”. Failing there we have more success with a café stop followed by a slow pedal through the town in search of a boulangerie, which, once found, provides PaRs of the choc-chip variety that we consume immediately. 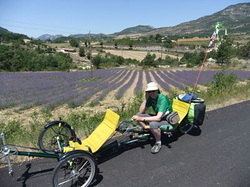 Onwards on a scenic, but challenging road through St Martin, Vercoiran and Ste Euphémie sur Ouvèze. Before St Auban sur l’Ouvèze there is a pizza café. It is very hot and we are not sure what we might or might not find by way of refreshment in the villages ahead, so we pull in for SdM&C and a cold water fill for our drinks bottles. Climbing through St Auban we traverse the delightful small but deep Ouvèze gorges on the way to la Rochette du Buis. At the next road junction there are some trees so we pull off the road to sit on the trike in shade for our picnic lunch. Re-fuelled it is time to climb again until we reach the Col d’Aulan at 845m. The descent is quite spectacular as we whizz down the narrow gorges of the Toulourenc. Two gorges today that we hadn’t really expected. They are shown on the map, but once we left the Ardèche we rather got out of the way of having a ‘gorges’ expectation. This is turning out to be a really good scenic day with a landscape quite distinct from any travelled through so far. We pass around the impressive sight of Montbrun clinging to the steep hillside, but are not tempted to enter into the village with its narrow and very steep lanes. This does not let us off climbing however, because we are now on a serious ascent all the way to Aurel. We press on, making several stops when a spot of shade appears in order to have a drink and cool down. It is very hot. We share these shady stops with various Czech cyclists who are in a small group strung along the road and struggling with the climb. At Aurel, le Relais du Mont Ventoux appears at the roadside with an inviting area of shaded seating perched on the cliff edge. There are other cyclists sitting there. Impossible to pass by so it is time for a sit down and SdM&C. The road from here to Sault turns out to be a pleasant level balcony ride beside and above the valley below. It finally delivers us into the centre of Sault. Our first port of call is the OdT for check the next few days weather forecast for Mont Ventoux. Tomorrow looks good, the following two days less certain. A bit of shopping, then we drop down the steep road from Sault to the valley bottom and take the back road to return to la Loge and our B&B. We are welcomed back. Before showering and changing John swops the touring panniers for smaller ones, checks the trike all over for any loose bolts or frayed cables and generally fettles it for tomorrow. S&W, chocolate and a rest. In the evening we take the car (strange experience this motorised travel) into Sault and search out the bike shop for a can of spray lubricant. We also fill up the car with diesel at the supermarket where fuel prices are quite good. Back in the town centre we settle on a restaurant beside the large terrace that gives Sault its splendid views out across the valley and of Mont Ventoux in the distance. We have the “cyclists meal”.